I'm trying to construct a plot which shows transitions from one class to another. I want to have circles representing each class sized according to a class attribute, and arrows from one class to another, sized according to the number of transitions from one class to another. Is there a more elegant way to do this than applying arbitrary scaling to the underlying data? A nice option is to generate the circumference of your classes as a series of points, adjusting the scale (diameter) according to your data. Then you draw the circles either as paths or polygons. Follows some example code. The circleFun was shared by @joran in a previous post. Does this work? I think you should tweak the circle scales acording to your real data. Also, from your use of arrow without attaching grid, I assume you have not updated ggplot2. I changed that code to work with my setup, and tried not to include any ggplot2 code that might cause backward compatibility issues. Not the answer you're looking for? 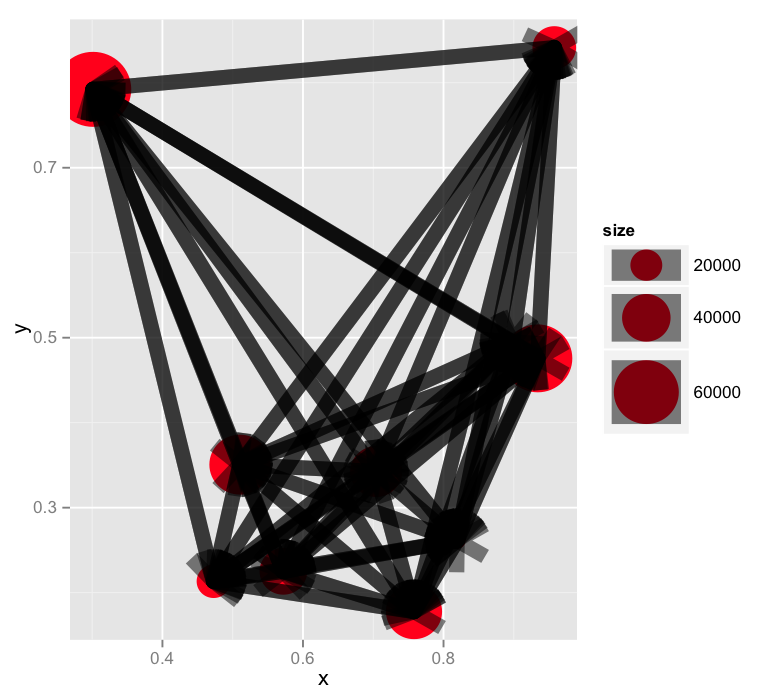 Browse other questions tagged r ggplot2 data-visualization or ask your own question.